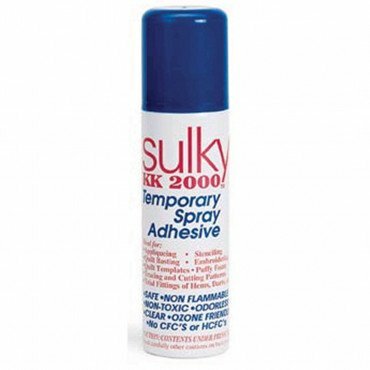 Sulky ® KK2000 ™ A temporary spray adhesive. KK2000™ temporarily bonds fabrics to appliqués, batting, stabilizers, and even to patterns and templates. You can reposition the fabric before stitching it in place; it works great with landscape quilting projects. Bonding disappears in 2-5 days. Nontoxic, odorless, ozone-friendly, nonflammable, will not stain. 3.6 fl. oz.Shipping restrictions apply.